Cryogenic techniques are currently used in scanning tunnelling microscopy (STM) and single molecule spectroscopy. 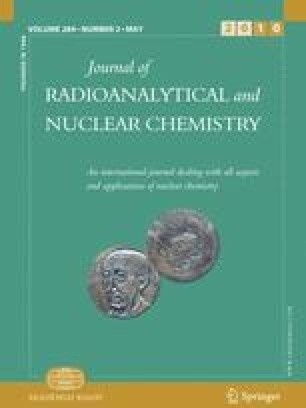 Recently such cryogenic devices have also been adapted to time resolved laser-induced fluorescence spectroscopy (TRLFS) systems applied to uranium(VI). In our study, we interpret TRLFS results obtained for the uranyl(VI) glucose system at room temperature (RT) and under cryogenic conditions of 153 K (cryo-TRLFS). A uranyl(VI) glucose complex was only identified by cryo-TRLFS measurements at pH 5 and not by RT measurements. The uranyl(VI) glucose complex was characterized by five emission bands at 499.0, 512.1, 525.2, 541.7, and 559.3 nm and a fluorescence lifetime of 20.9 ± 2.9 μs. The uranyl(VI) glucose complex formation constant was calculated for the first time to be logßI=0.1 M = 15.25 ± 0.96. Cryo-TRLFS investigation opens up new possibilities for the determination of complex formation constants since interfering quenching effects often encounter at RT are suppressed by measurements at cryogenic conditions. We thank Manuela Eilzer for technical assistance in laser spectroscopy measurements.